I pointed the camera toward the sky. A few stars were bright enough to use to focus. This was going to be a 100% manually set shoot. My intention was to go out and view Comet McNaught last night. For a variety of reasons (including disappointing results from others) I stayed home. Still, stars and sky were on my mind! I pulled out the camera (aka Clicky), threw on my 70-200mm f/2.8 lens (Thanks again Santa… how do you know? ), picked up my tripod and intervalometer and headed out to the deck. After yesterday’s hellish storms it was good to be outside on a clear, nicely breezy, warm night. The oppressive humidity of the afternoon was long gone. I pulled back the zoom from its maximum focal length down to 100mm then snapped off a shot at f/2.8, 1 second, iso 1600. I needed to make sure the camera would capture something. It did. Zooming in showed the picture was pretty sharp. The one second shutter was a critical number. 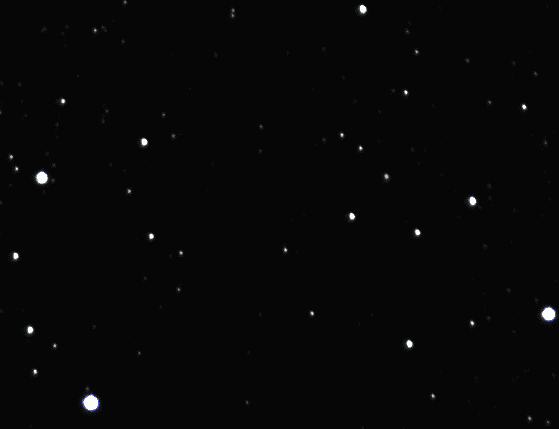 As you’ll see in the animation the stars move across the sky. Hold the shutter open too long and the stars will be streaky blurs. My last step was setting the intervalometer. I set it to six second intervals which gave me ten shots a minute. I let it run for around 45 minutes. The finished product was run through Sony Vegas 9, a video editor. Levels were adjusted, but there’s an interesting conflict between stars and noise if you bring the gain up too much. That’s a technique probably only learned through trial and error. Originally this was uploaded to Youtube. It was compressed so much the stars virtually disappeared. This method is a little better, but I’ll probably work on another method this weekend. Cool. What are the 4 or 5 yellow circular in line objects in the center left of the frame at about 9 seconds in? UFO’s? Wicked cool Geoff! I love stuff like this! BTW…took your advice and downloaded Google Chrome. I’m impressed with the speed. It did take some getting used to, but all in all I like it! Thanks! You actually captured the 3-D element- the stars shift at different rates. (If my eyes aren’t deceiving me.) Great stuff. Good grief no! From this distance all stars move in unison to the naked eye. Holy crap that is fantastic! The part most people are surprised at is it is shot with a still camera! It’s just a series of photos. OMG… This was so cool! More, please!!! Really? It’s been a while since I took astronomy. Really? That’s what I get for taking Astro pass-fail.